Males: 4 - 4.5 m (13 - 15 ft ), up to 6 m (19.7 ft). 3 to 5 times as long as it is broad at the base. Light tan or olive color with darker bands along back and tail. Small areas of India and Nepal. Once found through the Indian subcontinent. Not recently reported. Perhaps 200-400 adults; hundreds of hatchlings bred in managed care breeding programs released but survival rates not yet investigated. Excellent swimmers. 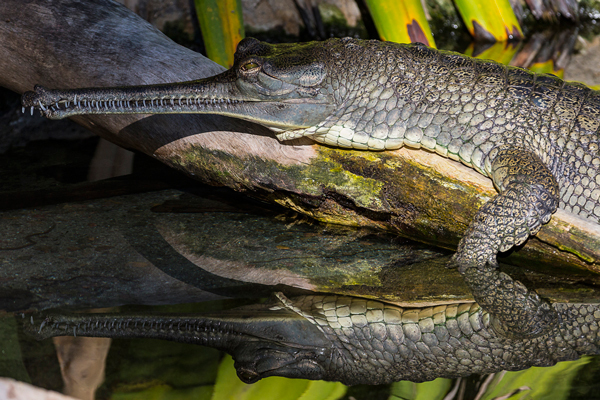 Do not move well on land, unlike other crocodilians—can only slide on their bellies. Spend most time sun basking, resting, and foraging. Single adult male and several females. Mainly fish; also, aquatic frogs. Occasionally other food items. © 2008-2018 San Diego Zoo Global. Population information updated 2018. 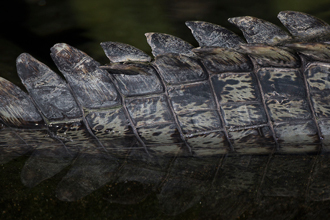 A gharial's vertically compressed tail helps it swim.